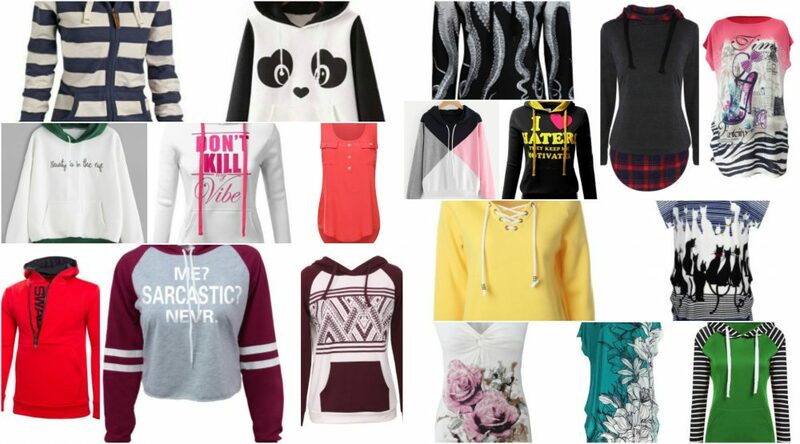 Trends 2018 – Models of hoodies for women & t-shirts online | Orice ieftin. Hanoracels are clothing that you wear especially in the autumn season to protect yourself from lower temperatures and cool days than usual. But nobody says that you are forbidden to look fashionable and fashionable with women’s jackets! hoodies for women 2018 are very cool clothes and can be worn lightly in everyday life. The personal casual style can even be distinguished by wearing hoodies for women who are in fashion trends this year! For the cold season, FashionMia keeps current trends and brings new colors and hoodies for women. I invite you to throw an eye on the site. Wears with leather trousers, jeans over the ankles, sport shoes, or shoes without a metallic finish. Below I chose a few pictures with the wear in different contexts or combinations to inspire you for the cold season! (Ro) Hanoracele sunt articole pe care le purtam în special în sezonul de toamnă/iarna pentru a ne proteja de temperaturi mai scăzute și de zilele răcoroase decât de obicei. Dar nimeni nu spune ca este interzis să te uiți la moda și sa alegi hanorace frumoase. Nu le purtam doar in sala de sport, pot fi purtate ușor în viața de zi cu zi. Stilul personal casual poate fi distins chiar prin purtarea de hanorace pentru femeile care sunt în tendințele modei în acest an! Pentru sezonul rece, FashionMia păstrează tendințele actuale și aduce noi culori și hanorace pentru femei. Vă invit să aruncați o privire asupra site-ului. Se poartă cu pantaloni din piele, blugi taiati sau nu, colanti sau peste o fusta sau o rochie. Mai jos am ales câteva fotografii pentru a vă inspira în sezonul rece! Essential in the wardrobe of a modern woman, T-shirts are fashionable regardless of the season. Assort them with casual or stylish outfits and choose cotton, viscose or jersey t-shirts. Keep those with prints and funny messages for simple outfits that need a special focus! I recommend you in the photos below the most beautiful models of women’s t-shirts online that you can order online. Simple shirts, T-shirts with prints, T-shirts with floral prints, T-shirts and animal prints, T-shirts with t-shirts and jerseys, T-shirts and sportswear, T-shirts and white T-shirts, shirts with mickey mouse, t-shirts with drawings or light shirts. ,,FashionMia is your online shop for Modern, Irresistible, and Affordable women’s clothing. Never before has dressing yourself been so easy. Our carefully curated selection of apparel, accessories, and outerwear are always at the market’s best prices. FashionMia is dedicated to delivering high-quality clothing to women that will make them fresh and elegant. We believe every woman has the right to dress right, and show their best sides to the world. We make it easy for you to live fashionable, confident, and chic from head to toe! Our online store is filled with the season’s hottest trends, available in all sizes. Our Plus Size selection offers the same stylish threads so every woman can show off their fashionable side. Every time you visit FashionMia you’ll find great sales on our already bargains. Fashion meets friendly finances right here. Get the greatest clothes you deserve at the prices you need, in the affordable way to keep your style on trend year round. Mie imi plac mult bluzele mai lungi, mai ales ca prefer sa port colanti. Eu port des hanorac, mi se pare comod dar chic. Ne ai aratat cateva modele super faine. Si eu sunt un mare fan al hanoracelor, ma salveaza de multe ori si pe langa asta sunt si comode. Chiar nu auzisem de FashionMia, dar vad ca au o gramada de lucruri dragute, intru sa vad ce-mi pot comanda. Pentru ca port frecvent colanti iarna , prefer bluzitele usor mai lungi! Am si eu cateva hanorace in garderoba. ce-mi plac, mai ales cele in dungi sunt superbe!